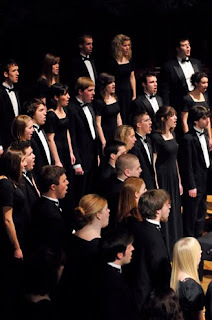 The acclaimed Whitworth Choir will be performing in venues across California March 19-26 during its spring 2011 concert tour. In conjunction with concerts at several of the tour stops, Whitworth President Beck Taylor will host receptions as part of the Taylor Tour 2011. The theme of the concert will be "To Everything There is a Season," taken from the focal work of the program, Hungarian composer Miklós Rózsa's rarely performed motet of the same name. The concert program will fall under three headings: New Life; Life in its Fullness; and Life in the Spirit. Featured works under New Life will include O Magnum Mysterium, by Tomás Luis de Victoria, Eric Whitacre's Lux Aurumque, and Estampie Natalis, by Vaclav Nelhybel. Selections under Life in Its Fullness will include To Everything There is a Season, by Miklós Rósza, and There is Sweet Music Here, by Stephen Chatman. Featured works under Life in the Spirit will include Reginald Unterseher's Pilgrim Spring, Marc and Judy Hafso's Standing on Holy Ground, and We Shall Walk Through the Valley in Peace, arranged by Moses Hogan. Following is information for each California concert location. Admission is free; a free-will offering will be received. For more information, please call (509) 777-3280. Also included is information about the Taylor Tour receptions that will be held in conjunction with several of the choir performances. For more information and to register for a president's reception, please visit www.whitworth.edu/taylortour or call (509) 777-3799. Wednesday, March 23, at 7 p.m.
Friday, March 25, at 7:30 p.m. The Whitworth Choir is regarded as one of the premier university choirs in the Pacific Northwest and continues to build upon an 80-year heritage of fine choral singing at Whitworth. The choir pursues an active schedule that includes the popular Christmas Festival Concerts in Spokane and the Seattle area, regular tours, performances of major works with orchestra, and recording projects. In 2009, the choir embarked on its first overseas tour in 40 years, performing in Uruguay and Argentina. Reflecting its commitment to music education and excellence, the Whitworth Choir has appeared at regional conventions of the American Choral Directors Association and state conventions of the Washington Music Educators Association and Music Educators National Conference. Director Marc A. Hafso is professor and director of choral activities at Whitworth University. He holds degrees in music education and choral conducting from Pacific Lutheran University, the University of Arizona, and Michigan State University. A versatile musician, Hafso is active as a guest conductor, clinician, adjudicator and published composer. He is president of the Washington State Chapter of the American Choral Directors Association.